Below is a list of five common financial mistakes, that you may have already made within your business. It is very common within a business for the prime movers to use their own money to support its cash flow. This may be in the form of a cash loan to the business, or it may be that you pay for business expenses on a personal credit card, or from your own cash savings. This may seem like a reasonable thing to do, however if you use personal credit cards to support your company, you could end up incurring significant costs such as high interest and charges. This is made worse by the fact that you cannot even offset those costs against your business related taxes. In some cases, directors go down this route because they believe that their business is unlikely to qualify for a credit facility. This may be because it is newly established, or because it has poor financials. Whatever the situation, there are likely to be facilities available to allow your business to be self funding, rather than subsidised by its directors. If your customers pay you late, the cash relating to that transaction is not available to your business. This could result in you either borrowing additional funds or experiencing cash flow shortages. The most important aspect of maintaining a healthy cash flow, in addition to regular cash flow forecasting, is to maintain an efficient credit control process. Please see our free guide about how to run your own credit control. Alternatively, if you do not want to undertake this function in house, there are plenty of outsourcers that will be happy to undertake it on your behalf. There are funding facilities such as factoring invoice discounting, which will bridge the cash flow gap between you raising invoices, and getting paid by your customers. However, that still does not excuse customers from not paying to terms. You may be able to improve this situation by pre-dunning, which is giving advance notice (either in writing, email or by phone) of invoices that are about to fall due. If you have been following our recent blog posts about “Retailageddon”, the spate of financial issues that have hit the UK retailers, you will be aware that even large companies can fail or experience financial problems. If you are supplying these companies, this could result in you experiencing a bad debt. You can protect against this situation. Either with standalone credit protection or with bad debt protection. Essentially, under these arrangements, you receive a credit limit in respect of each customer and providing you do not allow the sales to these customers to exceed that value, your invoices are protected against customer failure. Often it can be tempting, when you experience a cash flow problem, to dip into your VAT reserve, in order to make ends meet. The VAT reserve is the balance of VAT collected in respect of your sales, less any purchases that have offsetable VAT, that can be used to reduce the amount that you owe. It is good practice to set aside the VAT element so that you have the money to pay your VAT bill when it falls due. 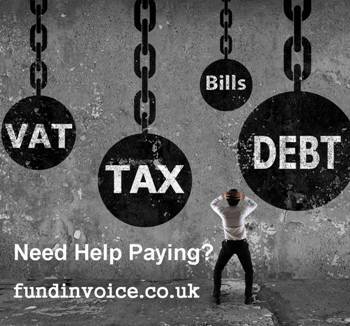 If you have failed to provide for your VAT payment, there are various forms of short-term finance available that may help you to clear your VAT liabilities. It is also possible that, if you need short-term access to funds, you can use this kind of business borrowing as an alternative to dipping into your VAT reserves. if you receive a large order, whilst it can be excellent for the profitability of your company in the medium term, it can require cash to finance production of any product, or staff for provision of services. If you do not have the cash flow available to finance a significant order, it can jeopardise your ability to deliver against other existing customer commitments. Please see our guide to financing large orders.